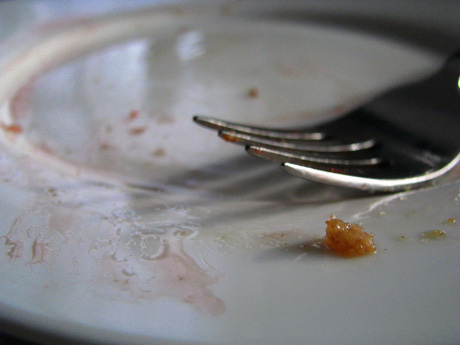 The way I remember it was like this......nestling gratefully and guiltless in my gut. Slowfood, Edible Vancouver, Ocean Wise, and Foodists form a virtual neighborhood of like-minded responsible citizens in Vancouver that also adore great food. Where these paths cross is exactly where you want be for dinner in Vancouver. The socially responsible Stephen Greenham made sure this happened last Sunday at his neighborly Trafalgars Bistro on 16th and Trafalgar in Kitsalano. Seems he invited all his good neighbors to sit down and enjoy Trafalgars Bistro’s locally sourced sustainable food program. What this means is that the menu is planned around what is available from his immediate neighbors rather than solely on what tastes good. This extra level of complication is preferred by chef Chris Beltrano. He makes regular trips to local farms to source fresh produce and inspiration, and then constructs his plates around those flavors. Trafalgars Bistro is the ultimate good neighbor because they not only act locally, they think globally. After a few years of partial participation they have now officially fully embraced the Vancouver based Ocean Wise program that is flooding major North American restaurants with conscientious procurement of good fish. Originating from the Vancouver Aquarium, this initiative lists edible seafood for restaurants that, when harvested, will have the least impact on world fishing resources. It’s karmic credit value is off the chain. 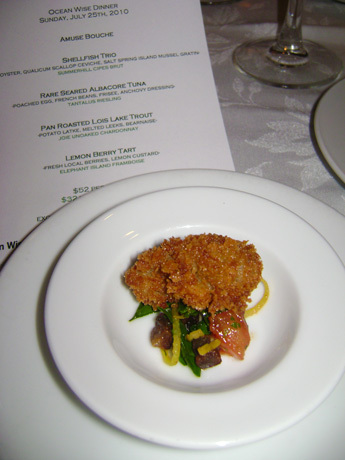 Deliciously delicately breaded Manila Clam on a bed of Gremolata and tomato. The touch of lemon zest made this dish sing. Chris continued to amuse us with a shellfish trio of Kusshi Oyster, Qualicum Scallop Ceviche and Salt Spring Island Mussel Gratin beautifully paired with the crisp apple notes of Summerhill Cepes Brut—one of the only BC bubblies I would go out of my way to purchase. 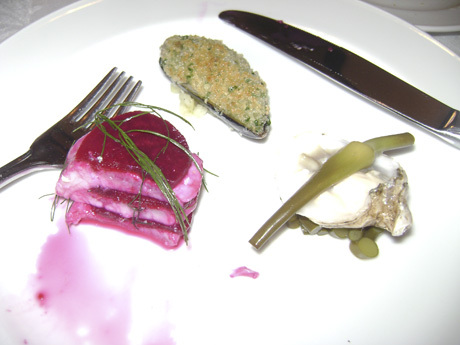 The scallop, striated with beets and infused with cherry, lemon vinaigrette, was outstanding but in the presence of the other two, it was hard to pick a winner on this plate. 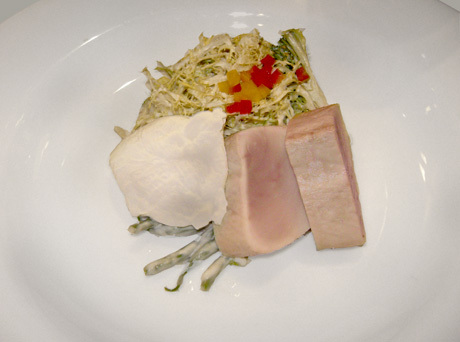 My absolute favourite dish of the evening was the Rare Seared Albacore Tuna with Saltspring Island poached egg, french beans, frisee and a light anchovy dressing. A perfectly cooked beautiful twist on a Niçoise salad that I ate with relish (no, not real relish!) and a clear conscience. Kelowna’s Tantalus winery and all their kiwi-wine making talent, make a Reisling that was chosen to enhance this course with a touch of sweetness. 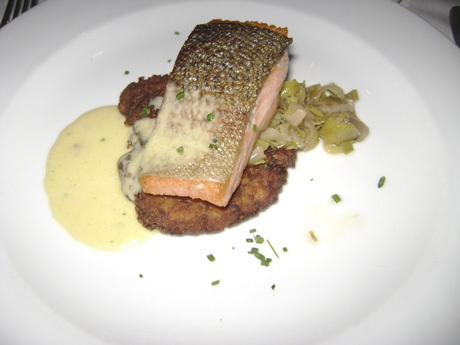 Next we were walloped with a Lois Lake pan roasted lake steelhead trout from just north of Sechelt (a very delicate flavoured salmon, really) served on a potato latke, “melted” leeks and béarnaise. Andrea Thorgillson paired the Joie Unoaked Chardonnay to meet the béarnaise very well and it was delicate enough not intrude on the lacey trout. Trafalgars has built their business and reputation for 17 years on their pastries and desserts, so I was really expecting the dessert course to be stellar. The flan styled lemon berry tart featuring fresh local berries on lemon custard did not disappoint. It was actually so good, and they vanished from every plate so fast, that both Philip Solman from Edible Vancouver and I, missed the opportunity to take a photo. The Canadian Wine Championship bronze medal winner Elephant Island Frambroise from Naramata was a natural, harmonious choice for the exquisite final pairing. The great part about the evening is that it brought us all together. Neighborhood regulars, owners, suppliers and fellow Foodist-like organizations were all excited to be a part of the launch and we stayed and chatted about the genius of it all. Steve always encourages his patrons to not only enjoy the food, but enjoy the life and company it brings to his tables. This and the responsibly sourced ingredients are precisely what Foodists are all about.